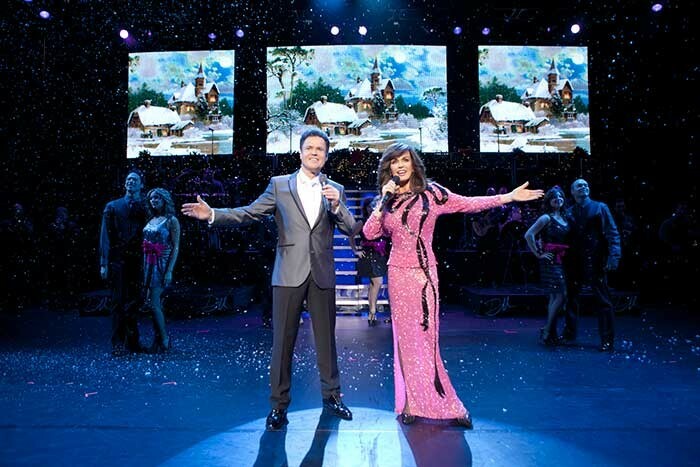 USA – Donny and Marie Osmond are spreading their holiday spirit in song and dance around the US on their 15-city Christmas tour. Pete’s Big TVs is again supplying a full video HD production system for the show, and enhanced its production values over last year’s tour. Based in New Castle, Delaware, video equipment rental company Pete’s Big TVs is providing a full HD production system with 3 new digiLED MK7 HB LED screens, 2 digiLED MC7 LED screens, plus 3 Sony HDC1500 cameras and 2 robotic cameras. The two-hour performance combines the costumed glitz of Las Vegas with the nostalgic feel in song and dance of old holiday variety TV specials. The stage set is a modification of their show at the Las Vegas Flamingo Hilton, now featuring a Christmas tree and a fireplace. Choreographed dancers and a live orchestra accompany the brother-sister team. These screens display a combination of graphics, holiday-themed images and historic video footage, enhancing the singing and dancing of hits and festive songs. Clips from old TV shows accompany Marie’s “Paper Roses” and Donny’s “Puppy Love” hits. This year, two extra LED screens – each left and right of the stage – are dedicated to displaying IMAG of the live action on stage. Composed of digiLED MC7 LED panels, these were chosen because of the high resolution picture quality required for the video. Pete’s Big TVs modified the LED panels to emit no radio frequency interference to interfere with the audio. The digiLED MC7 are among the most popular high resolution LED panels in Pete’s Big TVs’ inventory. Donny & Marie’s tour, under production manager Chris Acton, started Dec. 1 in Tulsa, OK and ends Dec. 21 in Minneapolis. Pete’s Big TVs’ crew includes Brian Brinckman, Brent Jones and Alex Keene. Glen Adams is the video director. 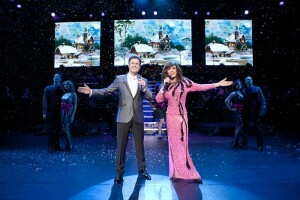 In picture: Pete’s Big TVs LED screens provide a visual backdrop to Donny & Marie’s Christmas shows. Two extra screens - not shown - were added this year for IMAG.